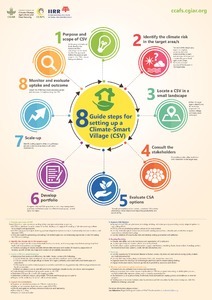 The poster discusses the steps in setting up a Climate-Smart Village (CSV). The eight steps are: determining the purpose and scope of CSV; identifying the climate risk in the target area/s; locating the CSV in a small landscape; consulting the stakeholders; evaluating the CSA options; developing portfolio; scaling-up; and monitoring and evaluating uptake and outcome. Sebastian L, Gonsalves J, Bernardo EB. 2018. 8 Guide steps for setting up a Climate-Smart Village (CSV). Wageningen, the Netherlands: CGIAR Research Program on Climate Change, Agriculture and Food Security (CCAFS).